I'm often asked by mamas what can they do with their expired breastmilk because the thought of throwing it out is devastating. Well what if I told you that your milk could still benefit not just your baby, but your whole family? Research has proven that breast milk, made into a lotion, is the latest alternative form of treatment for eczema, psoriasis, sunburns and itchy dry skin. Although the idea of rubbing breast milk on your skin may seem a bit unconventional, it is proven to be a safe and sometimes the superior treatment to other medicinal options. The antibodies found in breastmilk will help aid in the onset of infection that can be secondary to persistent scratching. Breastmilk lotion may not be for everyone, but for those who have tried everything with no avail, I hope you find some form of relief in the below recipe. 1.) Mix grape seed oil and beeswax within your bowl. Do not over fill the tbs with the beeswax, be very conservative. Just barely to the brim of the tbs. Microwave the oil and beeswax together for 2 ½ minutes. 2.) In a separate cup, add 2-3 drops of your favorite essential oil to the breast milk. This is optional and simply for scent. 3.) Take the grape seed oil and beeswax out of the microwave and whisk them together. 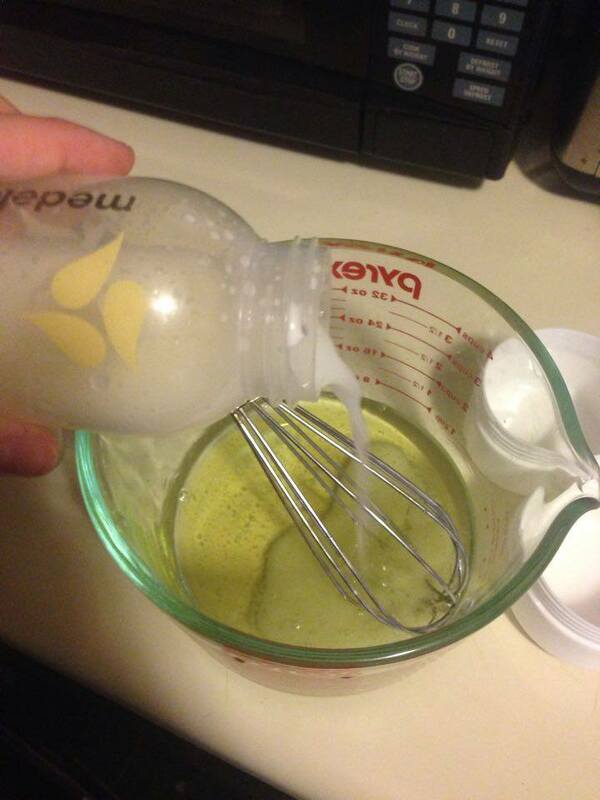 Promptly add your breast milk to the bowl, mix gently. 4.) Pour into any container that has a lid. 5.) Place in refrigerator and let set for 1 hour. Your lotion will now be done! Leave in the fridge for freshness. Has a shelf life of 3 months! You can use expired milk for this lotion. I personally used my foremilk for this one, which is more on the watery side. Beeswax can sometimes be difficult to find depending on where you live. I was able to find it at an all natural store called Apple Crate in North Carolina. Check local farmers markets within your area. Amazon also carries blocks of it. For this recipe, I used beeswax beads so that it would be easier to melt in the oil.